You can install the new colors sets in two ways: Individually by hand or by using the included iptheme files located in each color's folder. You must first install the base package. Then install the color of your choice. Just make sure that "Restore all icons before opening a new package" under Settings is not checked before you do so. *UPDATE 9/30/04* My apologize to those on dial-up. The file types have been revamped and expanded. 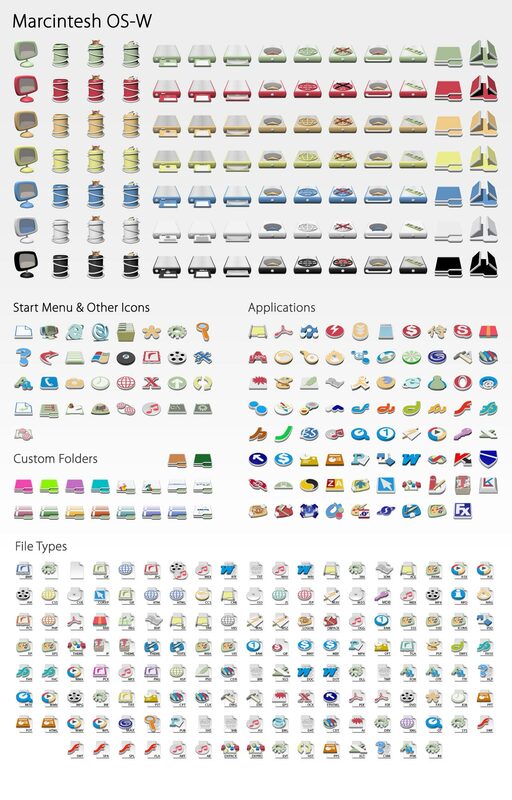 Some of the start menu & other icons have been redrawn. Some applications have been added. *UPDATE 7/27/04* This is the "OS-W Tabby" release of the Marcintesh icon pack. The drives have been redrawn and six colors have been added to the core set of icons. *UPDATE 6/11/04* Added various application icons, a few application folders and a bunch of colored folders to the package. Package include over 300 icons. Excellent icons - well done! Just looked at your previous icons (FarkusXP), and You should be really proud with what you have done here! You are progressing very nicely! Take care! Great work. Hope to see even more, such as for OD. I really like that you're using a variety of colors here - it makes things more visually distinct for those of use with fuzzy eyes. Cute Recycle Options too! These are stunning, really love the adobe folders + file types. Thank you everyone for your kind words! If anyone needs or wants other app folders or file types, feel free to leave a comment or email me. I'll be more than happy to keep updating this package. SkinUser TCMiller, pending approval from the mods, an Object Dock icon set is on the way. You should just add the standalone icons into the zip so people can choose and whatnot that way you won't get pestered with mail each time. I'm not sure I follow, vf... I was just gonna tack on the new icons to the end of the ICL file like I did with the app folders. These are great! I really enjoy them and the originality.. You should have entered them in the GUI Olympics! Thank you for sharing them!!! I think this set is ASTOUNDING!!!! But, I agree with vf, it would be great if you could include all individual icon files in the zip, rather than just an .icl. This makes it easier to customize each indivdual folder within XP, which can't be done with IP. The zip I uploaded contains an iptheme file and an ICL file (which includes the custom folders). For future reference, does everyone prefer an IP file along with various ICOs? todd martin, I would have entered them into the GUI Olympics but I think I missed all the events.